Lemmy was replaced by the cleaner, formally trained bass playing of Paul Rudolph. All members of the band were now contributing to the writing and arrangement of the music leading to more width in style, and the recording and production is better defined than previous albums. The greatest change is in the return of Robert Calvert, this time as a permanent vocalist rather than the peripheral poet role he occupied on Space Ritual. Not only did he bring crafted lyrics to the band, but he was intent on turning live shows into a piece of music theatre with specific characters for him to act out, Calvert explaining in a 1976 interview that "We're writing numbers now with visual ideas in mind, rather than trying to think of things to impose on numbers we've already got. We're trying to get the visual side of the band focussed on individuals rather than on screen projections. Nik, Dave and myself are, in some parts of the show, playing the parts of actors... All in all, it works up to quite a nice piece of theatre, spontaneous theatre that is." 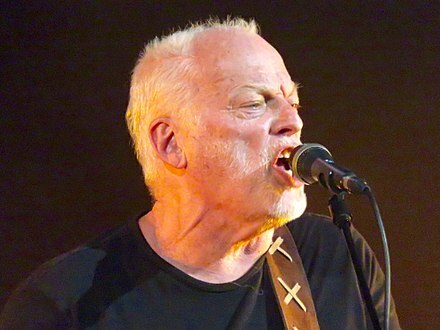 David Gilmour (as Dave Gilmour). Cover by Tony Hyde and Barney Bubbles.